Veda Vijnana Gurukulam has been organising a yearly Shastric exam since 2001. This event is called the Sankranti Sabha. It is a traditional exam which is oral in nature, in which a student studies a prescribed text and appears before the examiner. On the 2nd of February such an exam was held in the Gurukulam. On this day, the exam was conducted for 60 students studying in 7 different classes. 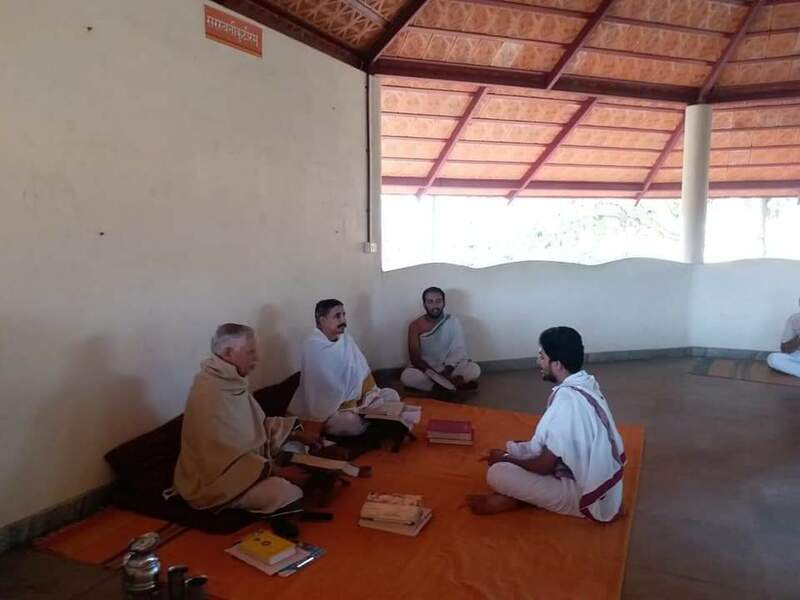 Scholars from Vedanta, Vyakaranam, Nyaya and Purva-mimamsa disciplines were invited as examiners. Advaita Vedanta texts like the Shankara Bhashyam of the Prasthanatrayam and Vedanta-paribhasha were prescribed. In Vyakaranam Siddhanta Kaumudi, Mahabhashyam, Paribhashendushekharah and Laghu Shabdendushekhara were given to the students. The process of examination was a whole day affair. A small inaugural function was followed by the exams. which began at around 9:30 am. Each student was called up and examined individually. The teachers of the particular discipline were also present to gauge the performance of the student. The examiners also noted down the positives and negatives of each students performance. This was later discussed with the student and plans were chalked out for each individual’s growth. On the 3rd of February, a Shastric discussion on a topic from the Brahmasutra Bhashyam took place. Prof. Mani Dravid Shastri presided over this shastric discussion. Prof. Ramachandra Bhat, former Vice-Chancellor was also present in the discussion. This nature of the topic of discussion was such that it allowed scholars from other disciplines to join the discussion. A panel of 7 scholars debated on the topic. The aim of this discussion was to give an idea to the students as to how shastric learning should be done and by watching luminaries they would also be inspired to study and achieve. Indic Academy is proud of it’s association with the Veda Vijnana Gurukulam, and extended it’s support to this year’s Sankranthi Sabha. Next PostThe Third Sanskrit Revolution: If Not In India, Then Where?